The last couple of months have been really busy so I’ve finally gotten around to post about little one’s birthday. Little one turned two on June 9th. 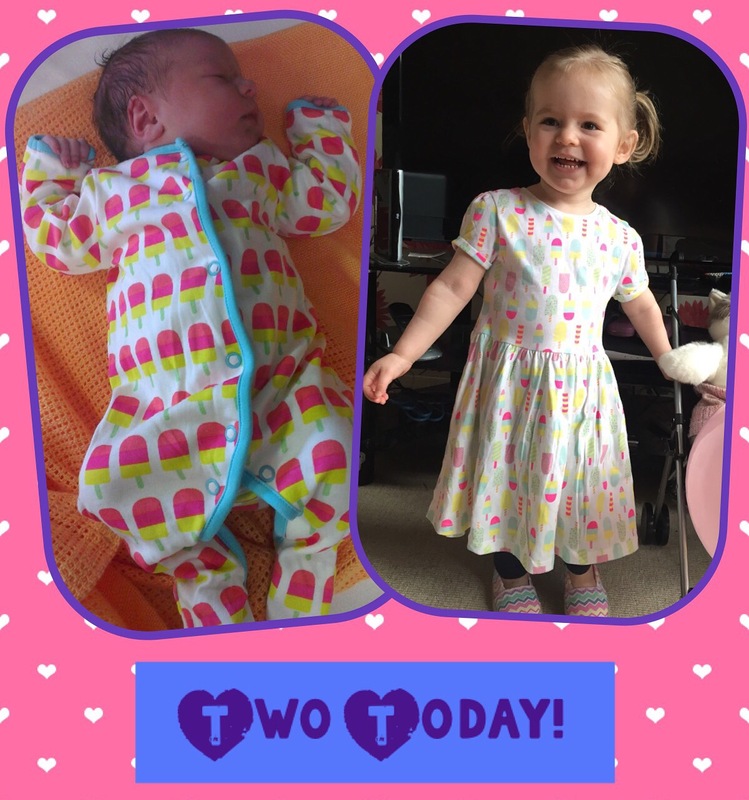 I imagine most parents feel the same, but I really wasn’t ready for her to turn two. She is changing everyday. Becoming more confident, learning new words and skills, just generally becoming more independent. Don’t get me wrong, I am so proud of the smart, kind and beautiful little girl she is becoming. However the more she grows, the further away from being my newborn she becomes. Anyway on her actual birthday we took her to the Sealife Centre in Brighton like we did on her first birthday. She thoroughly enjoyed herself and it was lovely to see her interacting with the fish. We also went for her first proper walk on the beach. She did well navigating the pebbles all the way down to the water. Then got a little stroppy she wasn’t allowed in! She had fish and chips for lunch at a pub off of the Lanes and picked out a Duplo playset from the Lego shop. A good day all round! 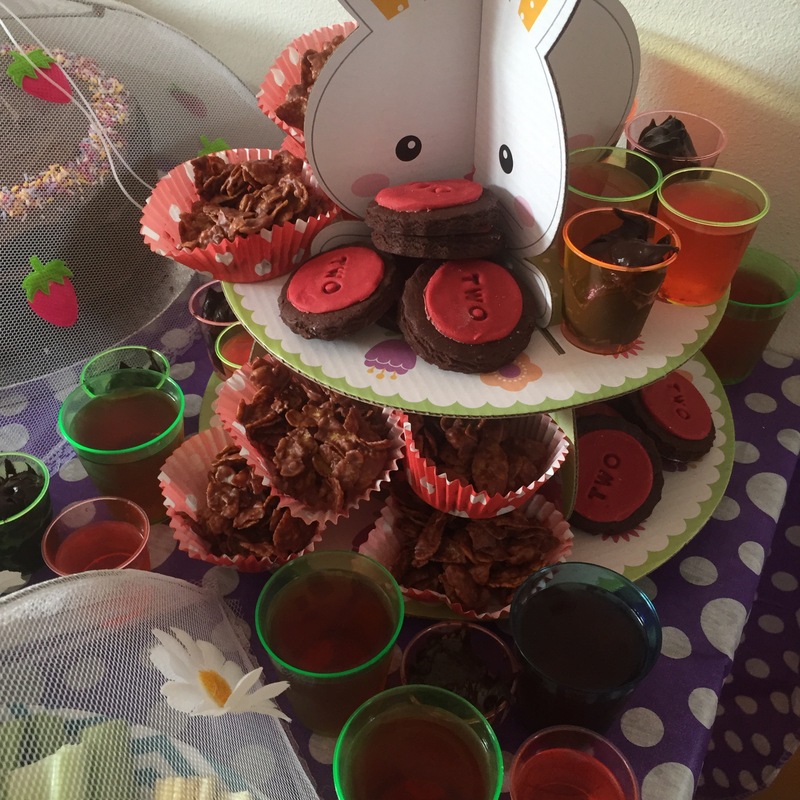 The Saturday after her birthday, we had a small tea party for family and friends. Unlike her first birthday I wanted to make sure that everything foodwise little one could eat. 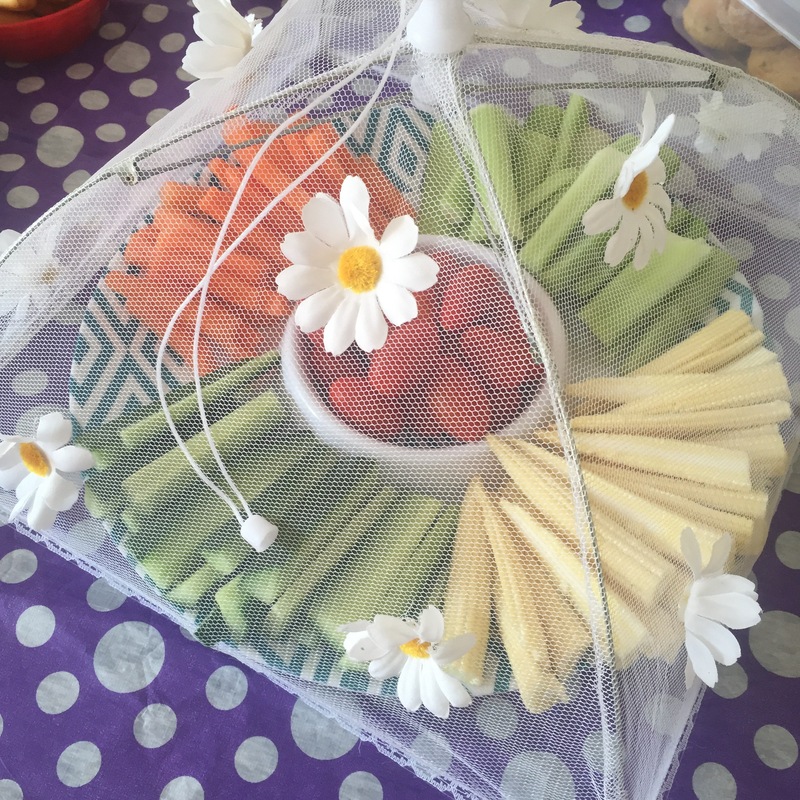 We had ham and tuna sandwiches with the crusts cut off, cocktail sausages, hummus and crudités, scones, cake, biscuits, dairy free pizza twists, jelly, chocolate mousse and crisps. 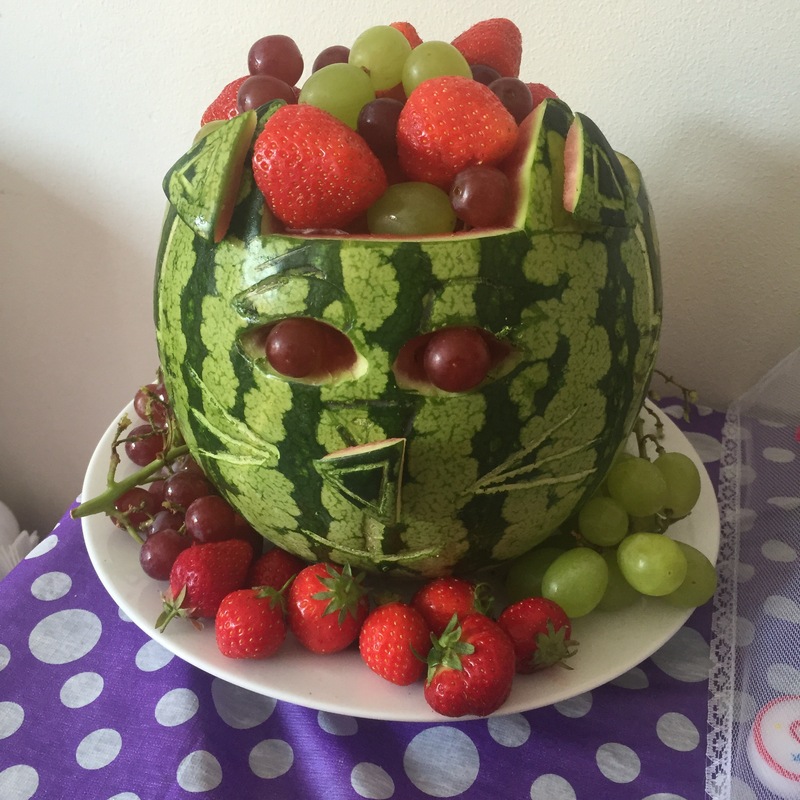 The centre piece was a watermelon cat filled with fruit, which little one’s uncle made. He made an amazing one for her first birthday too- a dinosaur! 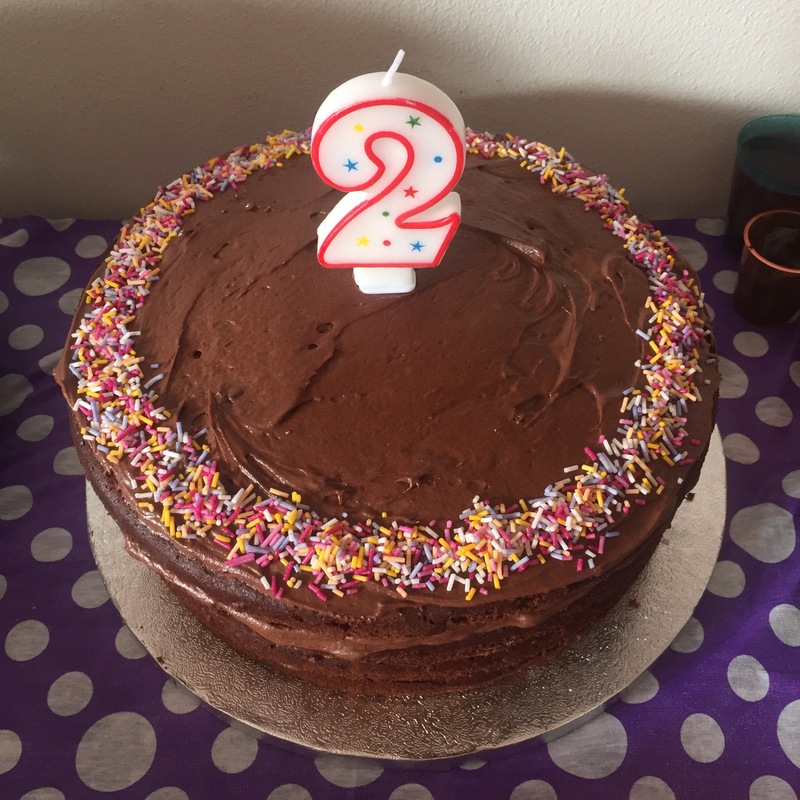 I’ve never had great success at making a dairy and egg free chocolate cake however this time I used a recipe from the Pure FreeFrom website. You can find the recipe here. It worked brilliantly and will definitely be my go to recipe when making cakes from now on. I used Oatly rather than soy milk and left out the cherries. The chocolate frosting was yummy too! I made two batches of the cake to give a four layered finish but only one batch of icing as I wanted a ‘naked’ look to it. Decorated with a ring of sprinkles. Job done! Little one seemed to enjoy it too. I did a test run of the party cake a couple of days before her birthday. 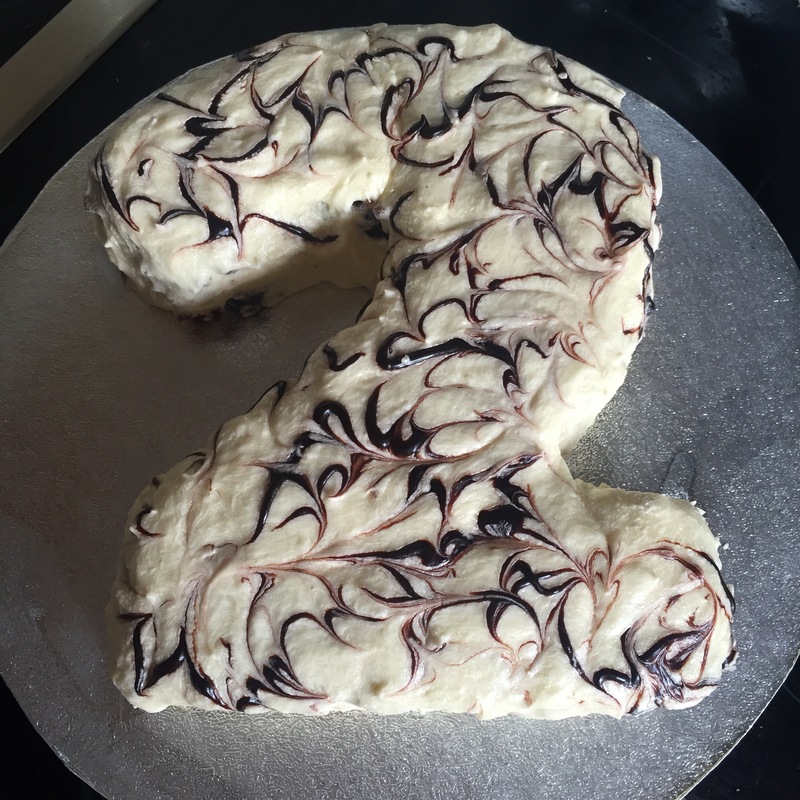 This one I cut into the number two and covered with a plain version of the Pure buttercream. I then swirled some Sweet Freedom Choc Shot through the icing for a marbled effect. It worked quite well. 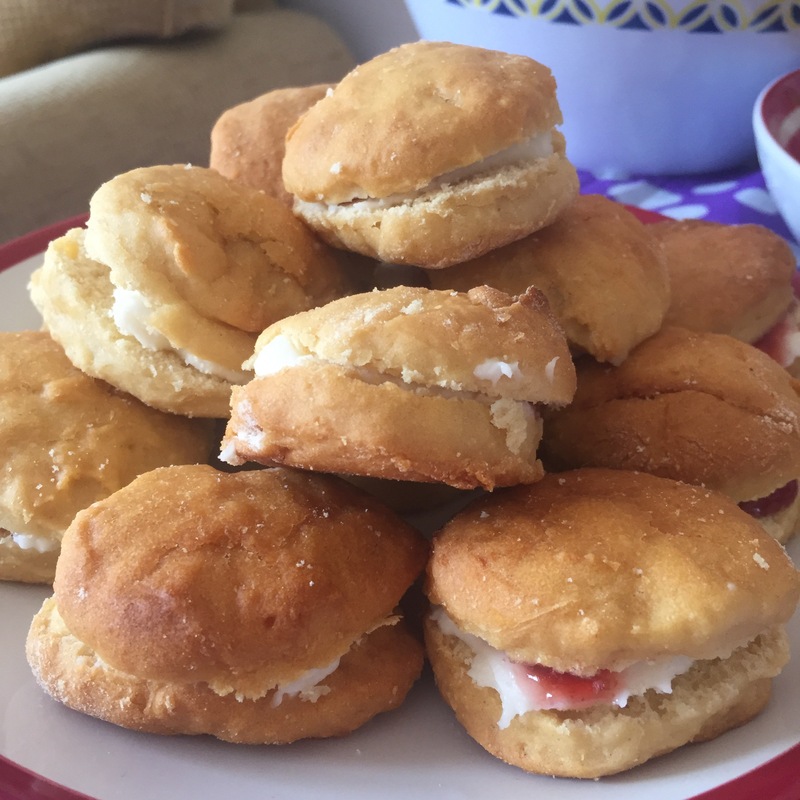 As well as the sandwiches, I made two different types of scone. The savoury herb version you can find here. I made a sweet ‘cream tea’ version as well. I followed the same recipe as the herby one except I left out the herbs (obviously) and added a tbsp of honey. For the cream tea filling I mixed a couple of tbsp of Violife creamy with a tbsp of icing sugar until smooth and then topped with jam. I always make my cream teas with the cream first followed by the jam. Not sure whether that is the Cornish or Devonshire way to do it. 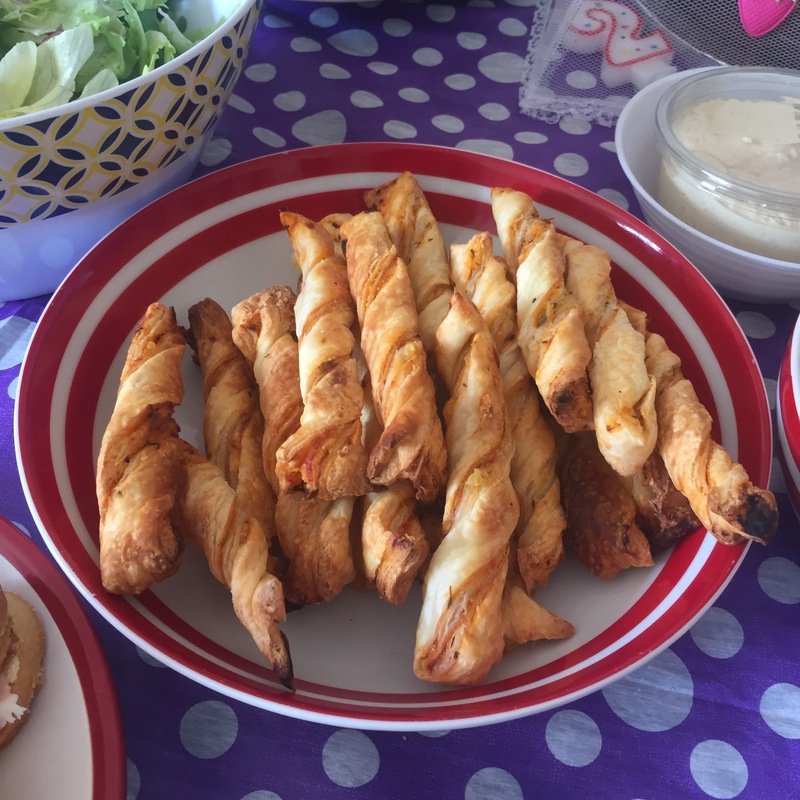 Accompanying the savoury options I made puff pastry pizza twists (I’ll post the recipe for those soon) and hummus with crudités. I made a range of sweet treats from jelly to chocolate mousse. The chocolate mousse was super easy and relatively healthy with a hidden ingredient! I’ve posted the recipe for chocolate avocado mousse a few times on my Instagram page but I’ll pop it here as well. Blitz it all together in a food processor and chill in the fridge for at least an hour. We used up some leftover dairy free Easter egg chocolate to make chocolate crispy cakes. I used Moo Free Cheeky Orange Chocolate egg. 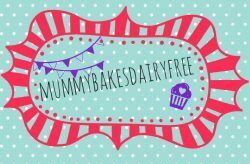 Their range is not only dairy free, but is also free from soya, gluten, wheat and eggs. It’s organic and vegan! Winner!! I simply melted the broken up chocolate in a bowl over some boiling water. Once melted, I stirred the handfuls of corn flakes and crushed shreddies into the mix until there is an even balance between the chocolate and cereal. I then spooned some of the mix into cupcake cases and popped into the fridge to set. To finish the sweet treats I made some chocolate biscuits using one of my old recipes. I topped some with a disc of ready to roll red coloured icing from Tesco. It is free from most things apart from sugar! Funnily enough little one wasn’t overly keen on the icing and peeled it off! I used a cute icing stamp tool which I received as a Christmas present from a friend to decorate the icing with two. Looking back over the pictures now I realise quite how much chocolate played a part in the birthday tea. I tried to offer a range of sweet treats and healthy options. As much as possible I used healthier alternatives however life is all about moderation. So little one mainly ate crisps, jelly and chocolate mousse that day (and a few that followed). That isn’t her diet every day or week. I really want her to grow up enjoying her food, being able to make the right options whilst having treats now and then. It’s about balance. With a diet goverened so much by what she can’t eat I was so happy to provide her with a birthday party tea which meant she didn’t miss out and I didn’t have to worry about what she was eating either!